Given the number of conveyor-related accidents that occur during routine maintenance and cleanup, every bulk material handler has a vested interest in technologies to help reduce hazards and prevent injuries. Seemingly mundane tasks, such as adjusting belt cleaners and removing spillage often require employees to work in close proximity to the moving conveyor, where even incidental contact can result in serious injury in a split second. Further, spillage can contribute to the risk of fire by interfering with pulleys and idlers and by providing potential fuel. Even worse, in confined spaces, airborne particles can create the right ingredients for an explosion. The buildup of fugitive material can occur with surprising speed. Spillage in an amount equal to just one sugar packet (about 4 g) per hour will result in an accumulation of about 700 g at the end of a week. If the rate of escape is 4 g/min, the accumulation will be more than 45 kg/per week, or more than 2 tpy. If the spillage amounts to just one shovelful per hour (not an uncommon occurrence in some operations), personnel can expect to have to deal with more than 225 kg of fugitive material every day. Although there are a number of belt cleaning technologies available to conveyor operators, most designs in use today are blade-type units of some kind, using a urethane or metal-tipped scraper to remove material from the belt’s surface. 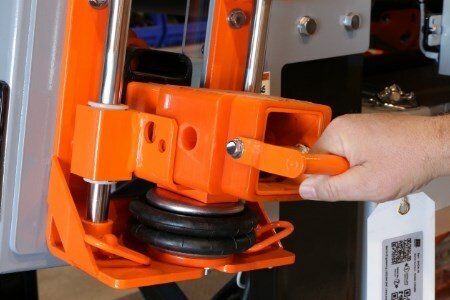 These devices typically require an energy source - such as a spring, a compressed air reservoir, or a twisted elastomeric element - to hold the cleaning edge against the belt. Because the blade directly contacts the belt, it is subject to abrasive wear and must be regularly adjusted and periodically replaced to maintain effective cleaning performance. The ability to maintain the proper force required to keep the blade edge against the belt is a key factor in the performance of any cleaning system. Blade-to-belt pressure must be controlled to achieve optimal cleaning with a minimal rate of blade wear. There is a popular misconception that the harder the cleaner is pressing against the belt, the better it will clean. But research has shown that there is actually an optimum range of blade pressure, which will most effectively remove carryback material. Increasing tension beyond this range raises blade-to-belt friction, thus shortening blade life, increasing belt wear, and increasing power consumption -- without improving cleaning performance. Operating a belt cleaner below the optimum pressure range also delivers less effective cleaning and can actually accelerate blade wear. A belt cleaner lightly touching the belt may appear to be in working order from a distance, whereas in reality, excessive amounts of carryback are being forced between the blade and the belt at high velocity. This passage of material between the belt and the blade creates channels of uneven wear on the face of the cleaner. As material continues to pass between the blade and the belt, these channels increase in size, rapidly wearing the blade to a jagged edge. A common source of blade wear that often goes unnoticed - even with a properly installed and adjusted cleaner - is running the belt empty for long periods of time. Small particles embedded in the empty belt’s surface can create an effect like sand paper, increasing the wear rate of both the blade and the belt. Even though the cargo may be abrasive, it often has moisture in it that serves as a lubricant and coolant. To overcome the problem of the blade angle changing as the blade wears, a radial-adjusted belt cleaner can be designed with a specially-engineered curved blade, known as “CARP” for Constant Angle Radial Pressure. With this innovative design, the changes in contact angle and surface area are minimised as the blade wears, helping to maintain its effectiveness throughout the cleaner’s service life. New air-powered tensioning systems are automated for precise monitoring and tensioning throughout all stages of blade life, reducing the labour typically required to maintain optimum blade pressure and extending the service life of both the belt and the cleaner. Equipped with sensors to confirm that the belt is loaded and running, the devices automatically back the blade away during stoppages or when the conveyor is running empty, minimising unnecessary wear to both the belt and cleaner. The result is consistently correct blade tension, with reduced power demand on start-up, all managed without operator intervention. For locations lacking convenient power access, one self-contained design uses the moving conveyor to generate its own electricity, which powers a small air compressor to maintain optimum blade pressure at all times. Even the best-designed and most efficient of mechanical belt cleaning systems require periodic maintenance and/or adjustment, or performance will deteriorate over time. Proper tensioning of belt-cleaning systems minimises wear on the belt and cleaner blades, helping to prevent damage and ensure efficient cleaning action. Belt cleaners must be engineered for durability and simple maintenance, and conveyors should be designed to enable easy service, including required clearances for access. Service chores that are straightforward and “worker-friendly” are more likely to be performed on a consistent basis. The use of factory-trained and certified specialty contractors can also help ensure that belt cleaner maintenance is done properly, and on an appropriate schedule. Further, experienced service technicians often notice other developing system or component problems that can be avoided if they are addressed before a catastrophic failure occurs, helping conveyor operators avoid potential equipment damaging and expensive unplanned downtime. By setting the cleaning goal necessary for each individual operation and purchasing a system adequate for those conditions as laid out in CEMA standards, it is possible to achieve carryback control and yet obtain long life from belt cleaners. The bottom line is that properly-installed and adjusted belt cleaners help minimise carryback and spillage, reducing risk and overall operating costs.